Linus Torvalds is a famous Businessman from Finland, he is 49 years old and still alive, born December 28, 1969. 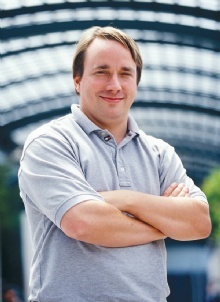 Linus Benedict Torvalds (born in Helsinki, Finland) and is the son of Nils and Anna Torvalds. The name Linus, he was the American chemist Linus Pauling. Linus went to Helsinki University in the period 1988-1996, where he received his master's degree in computer science. From February 1997 to June 2003 worked Torvalds of Transmeta Corporation, a company that develops and sells microprocessors and associated technology. Torvalds is now affiliated with Open Source Development Labs, a software consortium that aims to develop the Linux kernel. Linus Torvalds lives in Beaverton, Oregon, USA with his wife Tove (six times Finnish champion in karate) and three daughters: Patricia Miranda, Daniela Yolanda, Celeste Amanda and Randi the cat. Our collection contains 39 quotes who is written / told by Linus, under the main topic Technology. "There are lots of Linux users who don't care how the kernel works, but only want to use it. That is a tribute to how good Linux is"
"My name is Linus, and I am your God"
"In many cases, the user interface to a program is the most important part for a commercial company: whether the programs works correctly or not seems to be secondary"
"Linux has definitely made a lot of sense even in a purely materialistic sense"
"If Microsoft ever does applications for Linux it means I've won"
"I don't expect to go hungry if I decide to leave the University. Resume: Linux looks pretty good in many places"
"A consumer doesn't take anything away: he doesn't actually consume anything. Giving the same thing to a thousand consumers is not really any more expensive than giving it to just one"
"Microsoft isn't evil, they just make really crappy operating systems"
"When you say "I wrote a program that crashed Windows," people just stare at you blankly and say "Hey, I got those with the system, for free."" "The Linux philosophy is 'Laugh in the face of danger'. Oops. Wrong One. 'Do it yourself'. Yes, that's it"
"The fame and reputation part came later, and never was much of a motivator, although it did enable me to work without feeling guilty about neglecting my studies"
"Making Linux GPL'd was definitely the best thing I ever did"
"I've never regretted not making Linux shareware: I really don't like the pay for use binary shareware programs"
"You won't get sued for anticompetitive behavior"
"Most good programmers do programming not because they expect to get paid or get adulation by the public, but because it is fun to program"
"I never felt that the naming issue was all that important, but I was obviously wrong, judging by how many people felt. I tell people to call it just plain Linux and nothing more"
"When it comes to software, I much prefer free software, because I have very seldom seen a program that has worked well enough for my needs, and having sources available can be a life-saver"
"In my opinion MS is a lot better at making money than it is at making good operating systems"
"I've been employed by the University of Helsinki, and they've been perfectly happy to keep me employed and doing Linux"
"I try to avoid long-range plans and visions - that way I can more easily deal with anything new that comes up"
"I like to think that I've been a good manager. That fact has been very instrumental in making Linux a successful product"
"I don't try to be a threat to MicroSoft, mainly because I don't really see MS as competition. Especially not Windows-the goals of Linux and Windows are simply so different"
"Helsinki isn't all that bad. It's a very nice city, and it's cold really only in wintertime"
"Any program is only as good as it is useful"
"What commercialism has brought into Linux has been the incentive to make a good distribution that is easy to use and that has all the packaging issues worked out"
"People enjoy the interaction on the Internet, and the feeling of belonging to a group that does something interesting: that's how some software projects are born"
"Non-technical questions sometimes don't have an answer at all"
"I'm generally a very pragmatic person: that which works, works"
"I very seldom worry about other systems. I concentrate pretty fully on just making Linux the best I can"
"I do get my pizzas paid for by Linux indirectly"
"Finnish companies tend to be very traditional, not taking many risks. Silicon Valley is completely different: people here really live on the edge"
"Before the commercial ventures, Linux tended to be rather hard to set up, because most of the developers were motivated mainly by their own interests"
"I used to be interested in Windows NT, but the more I see it, the more it looks like traditional Windows with a stabler kernel. I don't find anything technically interesting there"
"Helsinki may not be as cold as you make it out to be, but California is still a lot nicer. I don't remember the last time I couldn't walk around in shorts all day"
"Intelligence is the ability to avoid doing work, yet getting the work done"
"I've been very happy with the commercial Linux CD-ROM vendors linux Red Hat"
"Artists usually don't make all that much money, and they often keep their artistic hobby despite the money rather than due to it"